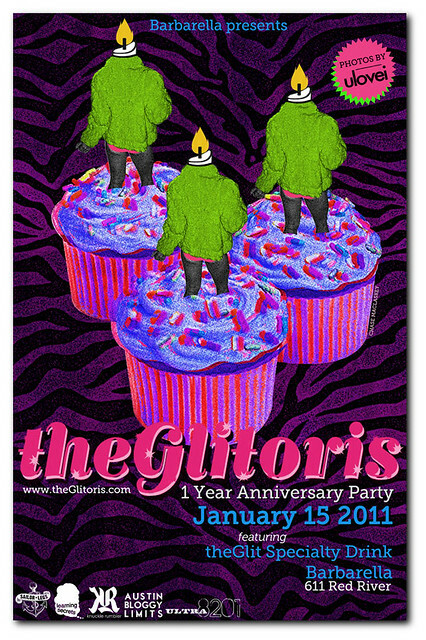 We are very proud to co-sponsor this party for the Glitoris.com's 1st Anniversary along with our good friends Sailor Legs, uLovei, Learning Secrets, Austin Bloggy Limits and Knuckle Rumbler. If you know those names then you know when we team up it will be a hell of a party. Get there early to avoid a line and a cover and enter below for a chance to win a wristband for the VIP party upstairs. See you all Saturday. Exclusive wristband access to theGlitoris loft party on the 2nd floor is limited, a drawing will be held Saturday morning at 11am, and guests will be notified via email.